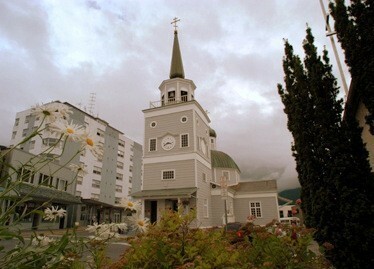 St. Michael's Russian Orthodox Cathedral is the first Orthodox Cathedral established in North America in 1848 by St.Innocent first bishop of Alaska. Russian explorers, hunters, trappers, and eventually missionaries, brought the Orthodox Faith to the shores of Alaska. The Orthodox Church excels in healing broken relationships, especially the relationship between God and man. Come and see! The mission of the Cathedral is the mission of the whole Orthodox Christian Church. Matthew 28:18-20 "All authority has been gicen to Me in heacen and on earth. Go therefore and make disciples of all the nations, baptizing them in the name f the Father and of the Son and of the Holy Spirit, teaching them to observe all things that I have commanded you; and behold, I am with you always, even to the end of the age." Come and see!